The tropical air mass remains in place and so too will elevated rain chances. Expect the activity to scale back for your first weekend of astronomical summer. After a shoddy forecast on Monday, Tuesday brought a nice rebound with about 60 percent of the forecast area receiving rain, as expected. 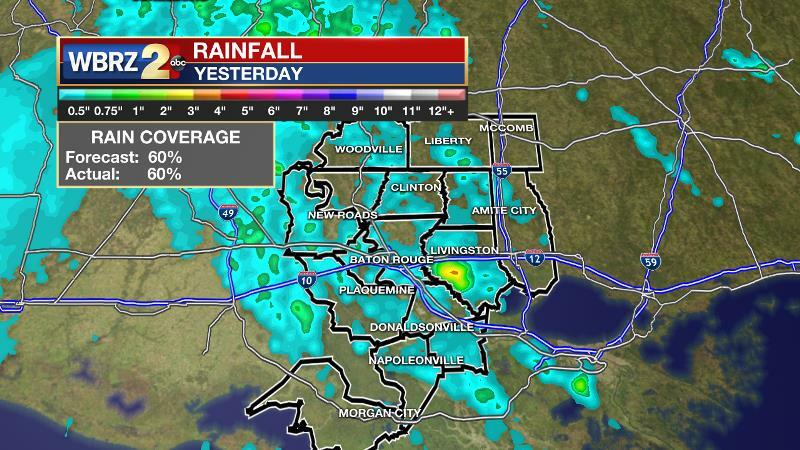 Tropical downpours did result in some heavier amounts with 3-4 inches estimated by radar in southern Livingston Parish. Highs briefly squeaked above the forecast of 85 degrees before clouds and rain brought numbers back on track. Today and Tonight: The air mass has gone largely unchanged so scattered showers and thunderstorms with brief downpours and gusty winds remain in play. Activity should take a little longer to develop and primarily occur during the afternoon hours. Overall, skies may end up a little less active today than earlier in the week. Highs will be near 90 with lows in the mid 70s. Up Next: A fast moving storm system to the north of the local area could provide another chance for showers and thunderstorms on Thursday—especially for areas north of the coast. 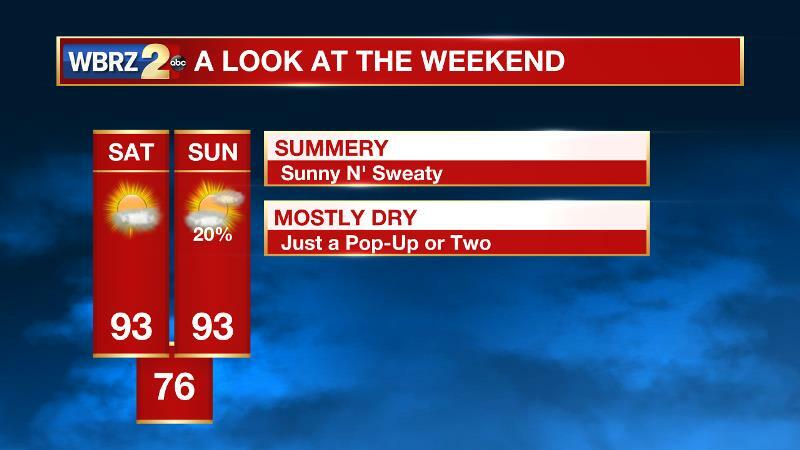 By the weekend, warmer and drier upper levels will start to cut down on rain chances meaning that the first weekend of summer could play out to be a littler drier, but plenty warm and humid. Feels-like temperatures in the afternoons will be in the low 100s. A pop-up or too could be around, but that is about it. The Tropics: The Atlantic Ocean, Caribbean Sea and Gulf of Mexico are quiet. No tropical cyclone formation is expected over the next 5 days. An inverted trough in the northwest Gulf of Mexico will continue to hug the western Gulf Coast with a tropical air mass from southwest Louisiana into Texas. The water vapor imagery shows the local area on the fringe of this deeper tropical moisture as a ridge in the eastern Gulf is starting to push westward. Still with ample moisture and daytime heating, scattered showers and thunderstorms will flare up, especially from in the afternoon hours through Wednesday. A shortwave trough will move across the middle of the country and by Thursday, the axis of this trough will create an area of positive vorticity advection over the local area. This could lead to increased rain chances, especially for the northern half of the forecast area. A slight upper level ridge will slide westward over the area by this weekend. Moisture will be shoved northwest of the area and subsidence will quell some convective development. The result of these changes will be diminishing rain coverage. The translation is that scattered showers and thunderstorms will become isolated, afternoon showers and thunderstorms. High temperatures should have no problem reaching the low to mid 90s. Dew points will stay very high in the mid 70s and that will create very uncomfortable conditions with “Feels-like” temperatures into the low 100s. That pattern looks to hold into at least early next week.